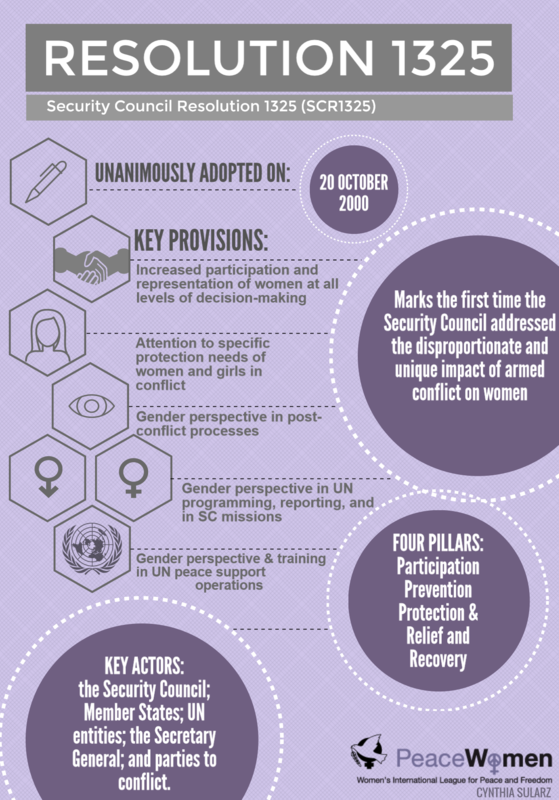 The first resolution on Women, Peace and Security, Security Council Resolution 1325 (SCR1325), was unanimously adopted by United Nations Security Council on 31 October 2000. SCR1325 marked the first time the Security Council addressed the disproportionate and unique impact of armed conflict on women; recognized the under-valued and under-utilized contributions women make to conflict prevention, peacekeeping, conflict resolution, and peace-building. It also stressed the importance of women’s equal and full participation as active agents in peace and security. • Increased participation and representation of women at all levels of decision-making. • Attention to specific protection needs of women and girls in conflict. • Gender perspective in post-conflict processes. • Gender perspective in UN programming, reporting, and in SC missions. • Gender perspective & training in UN peace support operations. Key Actors responsible for implementation of SCR 1325 include the Security Council; Member States; UN entities; the Secretary-General; and parties to the conflict. The Women, Peace and Security agenda is anchored in the principle that effective incorporation of gender perspectives and women’s rights can have a meaningful and positive impact on the lives of women, men, girls, and boys on the ground. Its interlinked and mutually reinforcing aspects (sometimes referred to as Pillars or the “3 Ps”) -- protection, prevention and participation -- are critical in respecting human rights and dignity and in tackling the root causes of conflict to create sustainable peace. Recalling its resolutions 1261 (1999) of 25 August 1999, 1265 (1999) of 17 September 1999, 1296 (2000) of 19 April 2000 and 1314 (2000) of 11 August 2000, as well as relevant statements of its President and recalling also the statement of its President, to the press on the occasion of the United Nations Day for Women's Rights and International Peace of 8 March 2000 (SC/6816). Security Council Resolutions 1261 and 1314 are focused on the theme of Children and Armed Conflict. Resolutions 1265 and 1296 are focused on the theme of the Protection of Civilians in Armed Conflict. Each month the Presidency of the Security Council rotates alphabetically, giving each of the fifteen members an opportunity to facilitate discussions and guide the deliberations of the Council. The country holding the Presidency has the prerogative to propose thematic debates and open sessions of the Council that invites the other UN Member States to contribute to the Security Council's deliberations on a particular topic, with the concurrence of other members. During its term on the Council, Namibia initiated the Open Debate of the Security Council on Women, Peace and Security, Canada initiated the debate on the Protection of Civilians in Armed Conflict, the Netherlands initiated the debate on Children and Armed Conflict, and Bangladesh held the Presidency when the Council issued a statement to the press marking International Women's Day in 2000. (Presidential Statement to Press, 8 March 2000: http://www.un.org/News/Press/docs/2000/20000308.sc6816.doc.html). Recalling also the commitments of the Beijing Declaration and Platform for Action (A/52/231) as well as those contained in the outcome document of the twenty-third Special Session of the United Nations General Assembly entitled "Women 2000: Gender Equality, Development and Peace for the twenty-first century" (A/S-23/10/Rev.1), in particular those concerning women and armed conflict.